New year, new you, new…Instagram hashtag. That’s right. Instagram has changed (yet again) the way we interact and post hashtags on their platform – as consumers and brands. When it comes to #hashtags, the only constant is how utterly powerful they can be for your engagement, brand awareness, and post virality. If you’re new to the hashtag game and are unfamiliar with how to utilize them on Instagram, we wrote up an excellent Instagram hashtag guide for you. So, hashtags are great. (Duh.) You should use them. (Of course.) But, like, how? 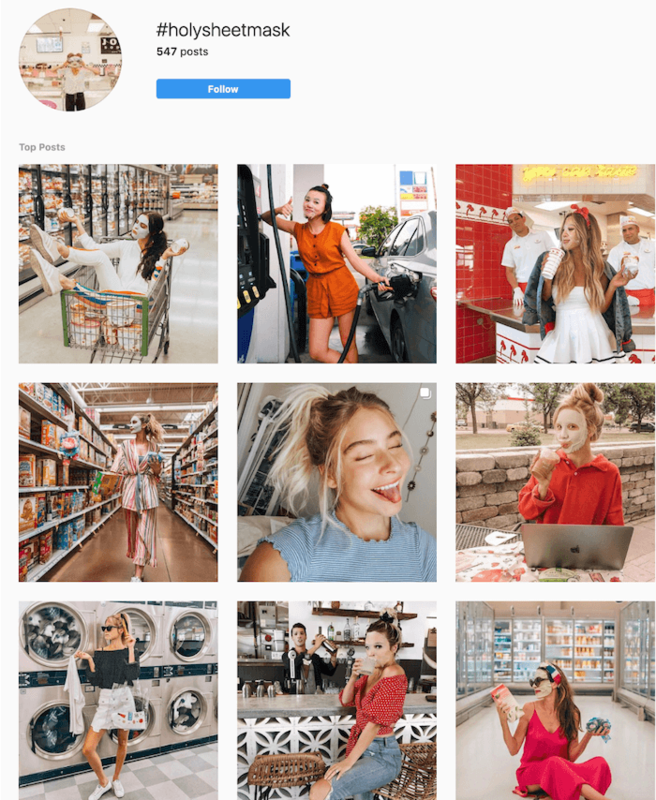 This year, the Instagram algorithm changes yet again, so how can you keep up with the ever-evolving hashtag rules? Read on, friends. And once you get up to speed on the hashtag game for 2019, you can use Sked to manage them! What are the Best (and Worst) Hashtags for Your Brand? How Many Hashtags Should You Post and Where? Where Can You Discover New Hashtags? Before we discuss the new stuff, let’s refresh our knowledge of Instagram hashtags. You may think that once you determine the best hashtags for your brand, they’ll be effective forever. Sadly, that’s not true. The Instagram hashtag discovery process is never-ending. One day, your hashtag blend might help you connect with new users and consumers. But because of Instagram’s continuous activity and millions of posts, that hashtag blend might not “work” the next day. From algorithms to audience activity, nothing on social media is set in stone. That’s why you need to stay up-to-date on Instagram hashtag trends, rules, and best practices. In fact, we’d say you should refresh your hashtag blends every month or so. If keeping track of all these different hashtags sounds like a chore, try using the Sked (formerly Schedugram) Hashtag Recommendation feature to find them. And the Hashtag Manager to organize and store them. You can separate your hashtags into groups and add up to 30 of them to a post with just a couple of clicks. Print out this monthly calendar and never miss out on celebrating a social media holiday again. Gone are the days of endlessly stalking loads of other accounts to see which hashtags are working the best. 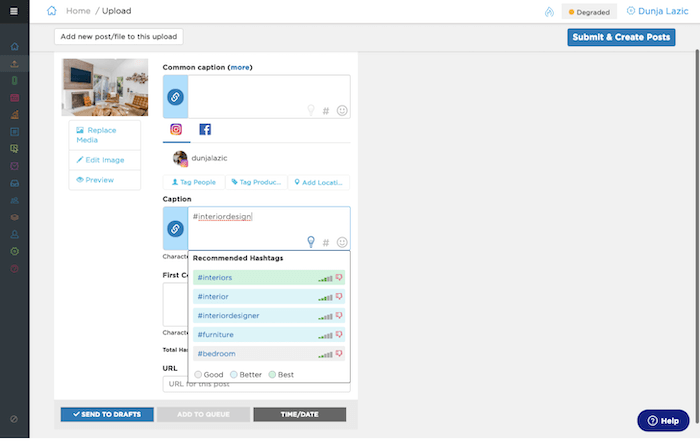 Now, Sked Social’s Hashtag Recommendation feature allows you to quickly see which hashtags are best suited to your content. To add a hashtag, open your account and click on the hashtag manager icon in the sidebar menu. Then, type in your hashtag in the ‘Template Content’ field (as in the image below). By clicking the lightbulb option, the Hashtag Recommendation feature will suggest hashtags that complement those you’re adding into the field. Depending on the suitability, hashtag recommendations will appear as green, blue or white. The Template Manager will help you to separate hashtags into lists. This way, the next time you go to post, you’re able to add an entire hashtag list to your post’s caption or first comment. Now, when you want to use your saved hashtag, just click on the hashtag icon in the caption or first comment section when you’re creating a post and choose the hashtag(s) you want from the pop-up list (see below). Once you’ve added your hashtags, click on ‘OK’ and continue creating your post. There are lots of different Instagram hashtags that brands use. They differ based on purpose, content type, engagement goals, and industry. Industry-related hashtags reference the type of business you have or work that you do. These could describe your company, brand, or the specific image you’re posting. For example, if you ran a smoothie shop in New York, you might use #newyorksmoothies, #fruitlovers, #newyorksmoothieshop, or #snack. Note: these are a mix of broad and location-specific hashtags. It is a good idea to mix hashtag volumes to increase your account’s chances of being showcased on the ‘featured’ page. Community hashtags dive a bit deeper into your business and describe your niche, audience, target market, and location. These hashtags aren’t as popular as your industry tags, but they tap into a more segmented user base – making them just as valuable (if not more so) for engagement. Community hashtags also tend to look more natural, to both your audience and Instagram. For example, if my smoothie shop specialized in vegan, organic smoothies, I might use #vegansmoothies, #healthysmoothies, #healthysnack, or #kentuckysmoothies. Branded hashtags are tags that are unique to your business and brand. Branded hashtags help with engagement and make it easier to collect and showcase user-generated content. For example, if my smoothie shop’s name was Allie’s Smoothies, I could use #AlliesSmoothies, #SmoothiesbyAllie, or something like that. Bonus: Put your branded Instagram hashtag in your Instagram bio to associate it with your account and encourage users to post it. Campaign hashtags can be super useful when running giveaways, events or collaborations. This way, all competition entries are located in the same place. Similarly, if you’re running an event, encouraging guests to use a campaign hashtag will help to create a gallery of images taken on the day. From a business perspective, this will make it that much easier to source user-generated content. Once you’ve selected the image you’d like to use, simply regram it using Sked Social’s regramming Google Chrome Extension. Regardless of what types of hashtags you choose to post, you should always avoid the overused, spammy hashtags. Examples of these are #likeforlike, #followback, or #instafollow. 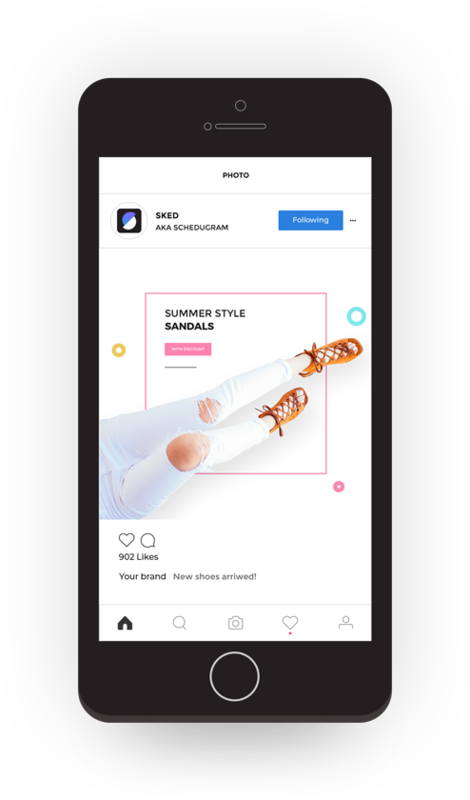 Not only will these be unhelpful for your content (since everyone is using them), but they’ll also potentially alert Instagram to bots and automatic postings – even if you’re not actually using them. How Many Hashtags Should you Post, and Where? Using even one Instagram hashtag can boost engagement and brand awareness. So, your goal with every post should be to include at least one. Better yet, studies show that the more hashtags you use, the more engagement and interactions you can expect from your posts. Because of this, I’d encourage you to use the maximum number of hashtags allowed: 30. If you choose to use all 30 allowed hashtags for your post, do your audience a favor and don’t post them in the caption. The best Instagram captions to be relevant, witty, and readable, and that’s not always possible when a caption is stuffed with hashtags and pound signs (#). Consider using only your two to three most relevant hashtags in the caption and placing the rest in the first comment of your post. Sked makes this super easy to do. To add them, just click on the hashtag icon in the first comment section (not in the caption like we did before) when you’re creating a post for Instagram or any other social media account (see below). Then, just choose the hashtag(s) you want to use from the list, add them, and click ‘OK’. You can hide up to 30 hashtags in the first comment. It’s a great way to make your posts look professional and not spammy. It’s best for your brand’s relevance and engagement to continuously research and test out new hashtags. Instagram sees over 1 billion daily active users, so the Instagram hashtag landscape is always changing. What works today might not work tomorrow. Thankfully, hashtag research is pretty easy once you know what you’re looking for. If you’ve yet to create a hashtag blend for your brand, start by looking at the content posted by competitors and industry influencers. These parties are likely posting the most relevant content to your brand. Once you have a rough outline of the types of hashtags you’d like to use, that’s where the Hashtag Recommendation tool steps in. With this tool you’re able to start typing a hashtag, then recommended hashtags for that post pop up. This all happens within Sked Social. By easily seeing which hashtags are best for your post, you’re able to save time while optimising your hashtag lists. Building a solid community on Instagram has always been important. But the need for this has well and truly spiked in 2019. We’re seeing more branded hashtags reigning supreme and elevating brand exposure. This has the potential to lead to viral campaigns which bring together like-minded accounts, all singing your praises. Lay’s #dousaflavor campaign saw Instagrammers voting for their favourite Lay’s flavour and going in the running to win $1 million. Disney’s #shareyourears hashtag use resulted in $5 being donated for charity with every share. And Sephora Collection’s #holysheetmask had users to post photos of themselves in unusual circumstances. Each encouraged Instagrammers to become a part of a larger community while growing the brand’s reach. In late 2017, Instagram introduced the ability to follow hashtags. If you’ve yet to utilize this, hop on Instagram, go to the Search page, and tap the Tags tab at the top. Type in and choose a tag, and Instagram will show you a dedicated page for that hashtag. Following hashtags allows you to become more familiar with the way target audiences are sharing posts. As well as this, you can encourage your followers to follow branded hashtags. In the example above, #smoothie has its own story, Most Popular and Recent Posts, related tag list, and Follow button. Similar to following Instagram users, following hashtags means that you’ll see tagged posts on your timeline and in your Instagram Stories. 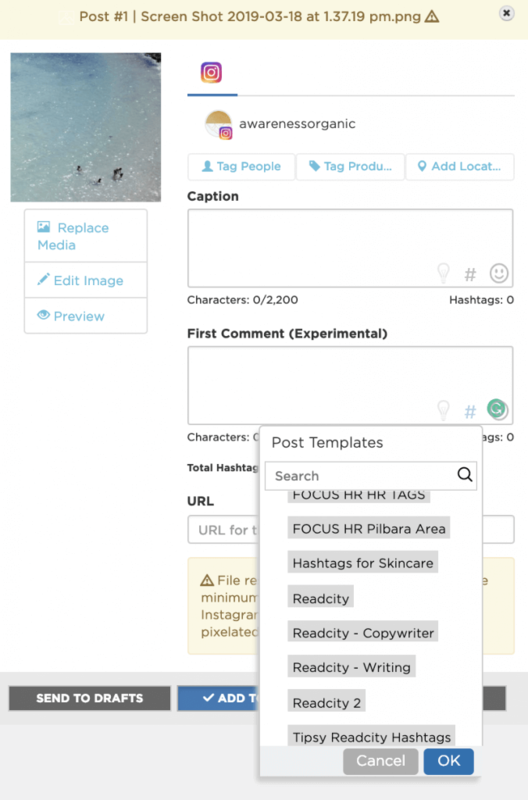 As an Instagram user, this feature allows you to stay updated on certain tagged content; as a brand, this feature introduces you to new content and content ideas surrounding a hashtag, enables you to keep an eye on your competition, and alerts you of new potential partners and influencers in your industry. Through the Follow Hashtags feature, Instagram has also made it easier than ever to discover new, relevant hashtags. Similarly, Sked Social’s Hashtag Discovery Tool allows you to seamlessly add relevant hashtags to your posts. Instead of simply discovering new hashtags, use this tool to sift out those that aren’t relevant to your content. Instead, get targeted hashtags that fit with your current hashtag strategy. Top Tip: Consider placing a “Refresh hashtags” reminder on your phone for every two to four weeks. Your followers and posts will thank you! If you didn’t know, you can add up to 10 hashtags to your Instagram Stories. This feature is great for accessing and engaging new audiences on Instagram. Also hashtags (and tagged locations) now have their own pages and dedicated Stories. Hashtagged Stories offer a fresh collection of information surrounding a particular tag – whether around an event, holiday, or brand. Top Tip: If you’re adding multiple hashtags to your stories, but don’t want to look like it – try hiding your hashtags. Simply use the text feature (not the hashtag sticker) to type a hashtag. Then, pinch the text on your screen. This will make your hashtag ‘disapear’ while still reaping the benefits of being featured in hashtag Story collections. To make the most of this feature, hide up to 10 hashtags. Team this with a location tag and your chances of discoverability just reached a whole new height. Regardless, the limit for hashtags on Instagram Stories is 10. But, ten hashtags can bog down an otherwise entertaining or educational Story, so consider hiding a few of the less critical hashtags behind a sticker. 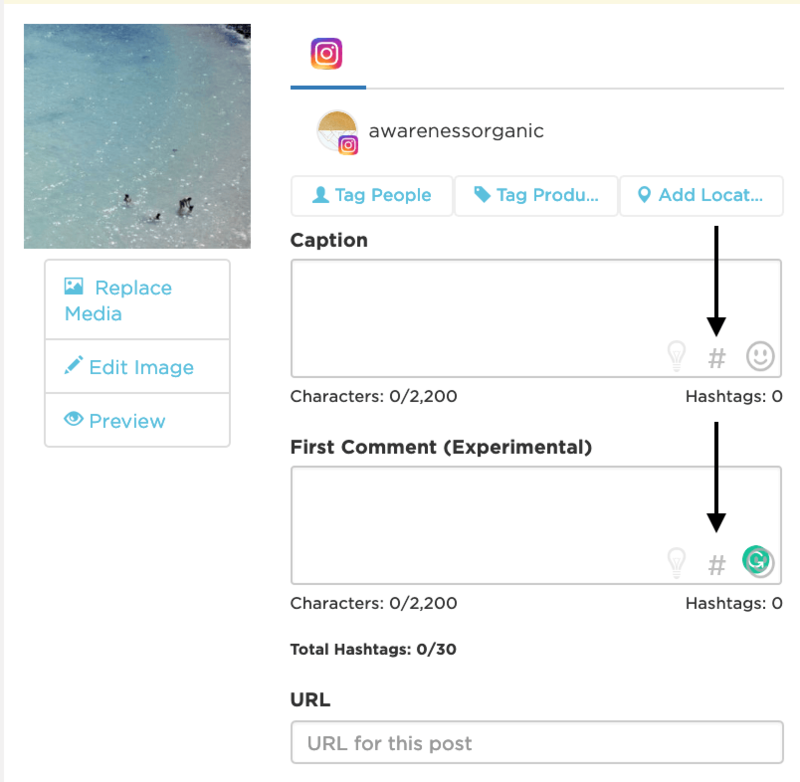 This method is reminiscent of hiding hashtags in the first comment of an Instagram post – it allows the focus to be on the content and not the tags. Measuring the effectiveness of and engagement from your Instagram content is a crucial part of marketing on Instagram. You’ve got to make sure that your posting activity is doing what it’s supposed to, right? On your Insights page, you can see the impressions and engagement for each post and get an idea of how effective your content is in reaching a new audience – including through hashtags. To access this data, open an individual Instagram post from your account. Click the blue View Insights button above the caption. A bar should pop up along the bottom with a preview of your Insights data. Swipe up to view the entire analysis. Under the Discovery section, you’ll see a breakdown of the post impressions, including the number of impressions were due to the hashtags you used. This number can tell you how effective your hashtag strategy is in reaching and engaging a new audience. As you discover and utilize new tags in your posts and Stories, keep an eye on this number to see if your hashtags are working! Along with Instagram Insights, there are plenty of other Instagram analytics tools and apps available. Instagram Insights is a good place to start, though, as it’s right there on your phone or iPad. Sked Social’s analytics tool will show you post performance over any selected time period. This can help to see a quick snapshot of which posts are performing best. From here you can see if there are any similarities across hashtag lists. Hashtags are one of the most important components of social media, especially Instagram. More importantly, hashtags are never (ever) static. Part of having a solid Instagram hashtag strategy is regularly refreshing your hashtag blend, whether through researching on Instagram, Display Purposes, or another tool. Another component of a successful hashtag strategy is staying updated with new tools and features across all of your social media channels. 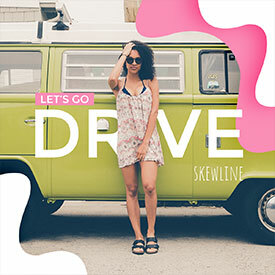 The ability to follow hashtags as well as place tags in all of your posts, not just Instagram, can help your brand discover and connect with a new audience – and potentially, new customers or clients. Never discount the power of hashtags in building brand awareness, driving engagement, and making sales from your social media channels!